Stifatho is a traditional Greek stew containing tomatoes and onions. 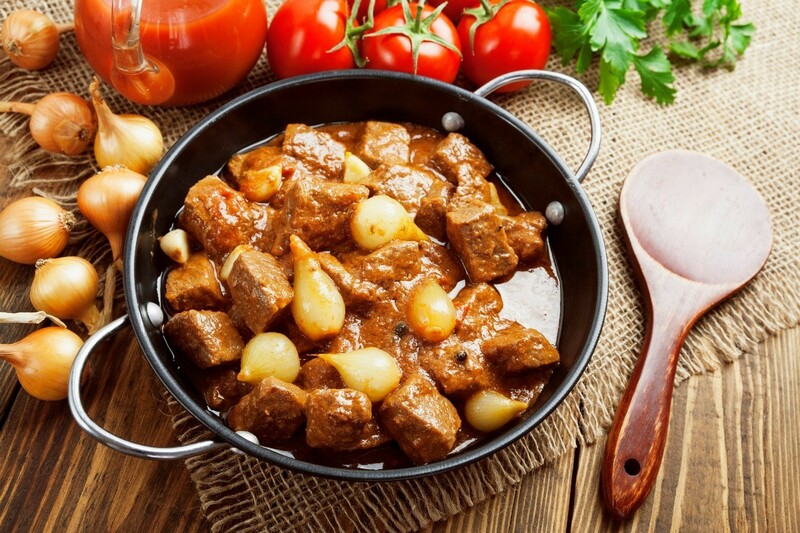 This guide contains a Greek stifatho (stifado) recipe. I know it's springtime but it's been chilly here this past week so I pulled out my Greek Grampa's beef stew recipe that I haven't made in years! My grandparents usually served the stew with potatoes or egg noodles but I decided to try orzo instead ;-) Serve with a Greek salad and feta, Kalamata olives, and crusty bread with unsalted butter on the side. Since I live alone, I have oodles left over to freeze in individual containers. If you plan doing that then freeze the stew and orzo separately. Mix the tomato paste and wine vinegar together in a bowl. Heat 3 tablespoons of the oil in a large stockpot and cook until beef is browned and top with the onions. Evenly pour the tomato paste mixture over the beef and onions. Evenly sprinkle the garlic, bay leaf, cinnamon, and clove over ingredients in the pot. Do not stir! Bring to a boil, reduce heat to low and cover and simmer on low for 2 to 3 hours, adding a very small amount of vegetable or beef broth if necessary. About fifteen minutes before the stew is ready, place the remaining 1 tablespoon of olive oil in one small sauce pan and the 2 cups of broth in another small saucepan and heat both. Add orzo to the olive oil and saute for 1 to 2 minutes then add the broth to the orzo. Simmer the orzo uncovered according to package direction time (usually about 9 to 10 minutes). The orzo should be fluffy and moist when done. Serve orzo on the side or topped with the stew and stew juices.